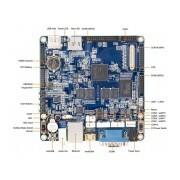 The Mini210S is built around a Samsung Cortex A8 ARM processor running at 1 GHZ. This 11x11cm board has elegantly arranged connectors and I/O and will mount a 4.3" LCD directly. Android, Debian, and other Linux based variants will run on these boards. Use C, C++, Python, Qt and all your favorite Linux tools.